Thanks for the AD. I saw it on paper and felt very warm and touched. Political is political, it won't change our true feeling in mind. I am truly hope Japan can be recovered pretty quickly and may the victims are all rest in peace. 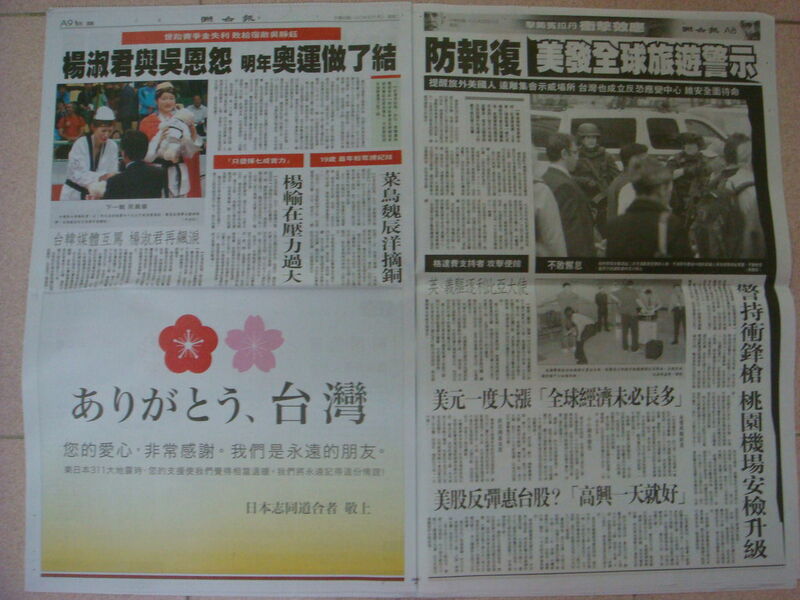 I appreciate your great favors and many Japanese were astonished for your help. accepted your concern as in a proverb says, 'A friend in need is a friend indeed'. At the same time, we consider the Japanese government was impolite to you so some Japanese people would like to say you thank you. 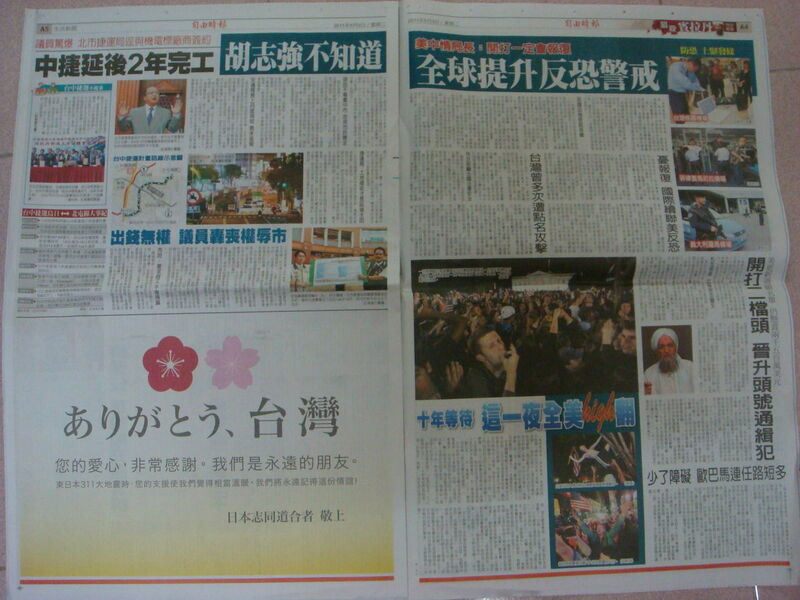 We know you may say 'Please give such much money to the victims instead of newspaper advertisement. ', but we live in a culture in which we have taught that we're supposed to thank you when we are helped by somebody else. 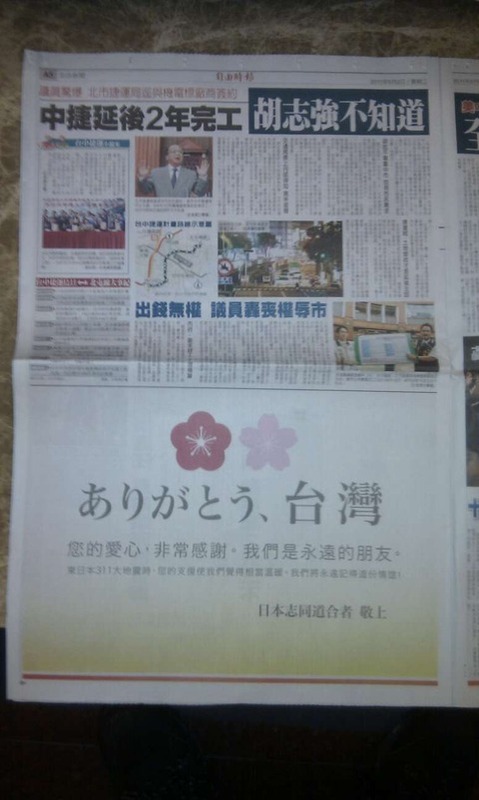 And thanks to you, in the course of raising the monetary donation for the newspaper advertising,over 10 million yen in donations has also been collected for the victims. Your heartwarming kindness enabled much more help for the victims ! We remember your kindness for a long time. 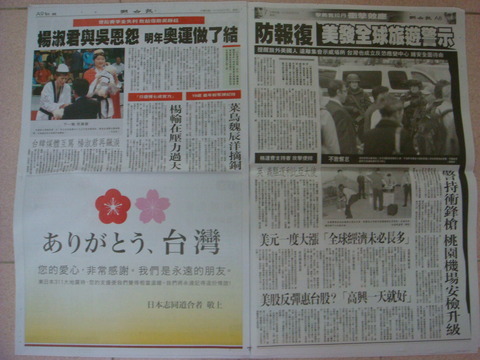 Japanese who did not fall victim to the 3.11 disaster works hard for the reconstruction. Best wishes for your continued health and happiness. 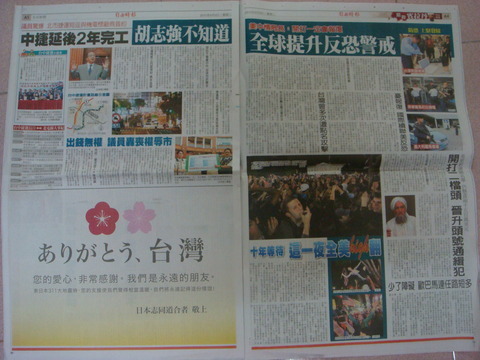 I have seen the thank message post on Newspaper. Simple and meaningful. Thanks to the originator Ms. Kisaka and many Japanese people that donate money or provide help. Welcome to Taiwan! 期待能看見重新綻放美麗櫻花的日之丸國土 , 以及從傷痛中再度復興站起來的新日本 , 也再一次的向全世界展現大和民族的驕傲與自尊吧 ! Thank you so much that you gave us the warm heart & hope. The Fukushima nuclear plant is a very difficult situation. We cannot repair the nuclear plant still now. The Japanese was using a lot of electric powers to do a luxurious living. I apologize for that. I'm sorry really. I'm from Taiwan! 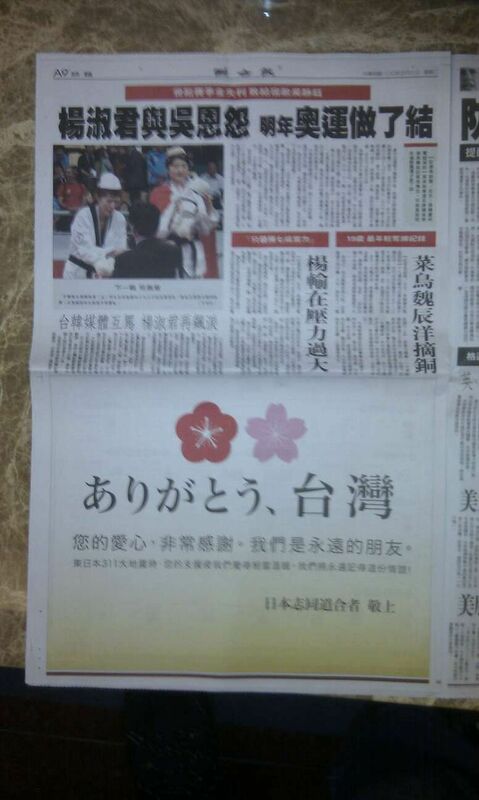 I felt so warm when I saw the advertisement on our newspaper yesterday. Now, I'm even more excited when I browse through everybody's messages. We hope that we can do our best in helping whoever needs help, our earth could thus be united as a solid whole.